All are welcome to celebrate Holy Week on April 13, 10 am – 2 pm, at Algoma United Methodist Church, 804 Parker Ave. in Algoma. 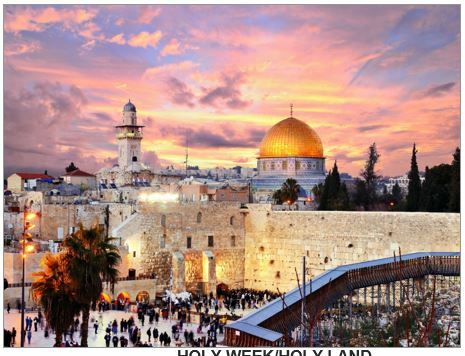 Walk in the footsteps of Jesus through an in-depth slide show of the Holy Land presented by Marilyn Hein at 10 am, 10:55 am, 12:30 pm and 1:25 pm. Visit the sacred sites of Nazareth, Bethlehem and Jerusalem; float in the Dead Sea; explore the ruins of Masada, and more. During intermission, visitors can soak up the tastes and sights of Abraham’s Tent, which will be filled with children’s activities, snacks, teas and coffees from the Middle East. Tammy Naze Kazmierczak will provide harp music at 10:45 am and 1:15 pm, and the Algoma United Methodist Men will serve a potato-pancake and sausage feast. The entire family is invited to this free event. A free-will donation is encouraged to cover expenses.